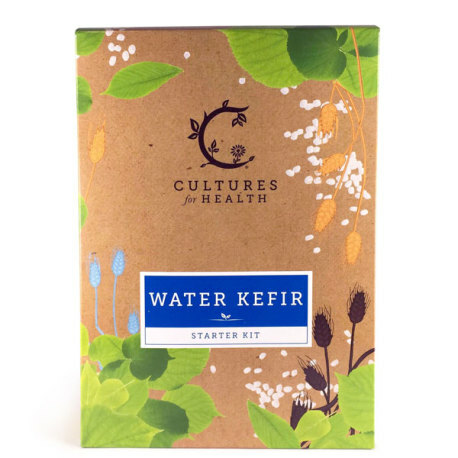 A whole kit to get you started making water kefir at home! Water kefir is a vegan beverage touted for its multiple health benefits. It is made by introducing a symbiotic culture of bacteria and yeast into a sugary solution, where the culture ferments the sugars and produces a delicious probiotic drink. This water kefir starter kit comes with a set of water kefir grains, instructions for activating and maintaining the grains, a mesh strainer, and a recipe book that has a plethora of ideas on how to make different types of kefir using the water kefir grains, including coconut kefir and fruit juice kefir. start making your own water kefir and enjoying the associated health benefits with this starter kit!